The WRC will be hosting its Spring 2019 meeting about the WRSM undergraduate certificate. Students from all majors should attend! Learn about what the certificate offers, what you need to do to complete it, and have any of your questions about the process answered. Meet other students who are completing this certificate and get some snacks. Hear from the Engineers Without Borders club, who will share what they’ve been doing to provide clean, sustainable water to communities in Panama. The WSU chapter is currently working with a community in rural Panama to ensure a year-round water supply with a) construction of a solar powered pump for river water and b) exploration of groundwater supply options. EWB needs people working on both the social and technical side of their projects, so all majors are encouraged to join! The Conference Planning Committee invites you to propose a Special Session for the conference. A special session organizers’ role is to propose a relevant and timely topic, recruit speakers to submit abstracts to the session, and moderate the session during the June 2019 Conference. Special sessions can be in the form of a panel discussion or a group of 5 or more oral presentations (full length or 5 minute lightning talks) on a specific topic. Multiple session track proposals are welcome. Those interested in organizing and hosting a special session should click here. Due date: September 21, 2018. Steve Olson to give a seminar on his book “Eruption: The Untold Story of Mount St. Helens” March 21, 5pm at WSU PACCAR 202. Steve Olson, who grew up in the Othello, Washington, will explore the historical forces that helped determine who lived and who died in the 1980 eruption of Mount St. Helens. Steve Olson is the author of Eruption: The Untold Story of Mount St. Helens, which was named one of the top nonfiction books of 2016 by Amazon and won the Washington State Book Award. He also is the author of Mapping Human History: Genes, Race, and Our Common Origins, which was nominated for the National Book Award, and other books, and he has written for the Atlantic Monthly, Science, Nature, Scientific American, Wired, the Smithsonian, and many other magazines. Since 1979, he has been a consultant writer for the National Academy of Sciences, the President’s Council of Advisors on Science and Technology, and other national scientific organizations. A native of Washington State, he now lives in Seattle. Co-sponsors: Foley, CEREO, WRC, CEE, English Dept. 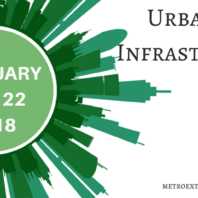 Join the Western Center for Metropolitan Extension and Research’s Urban Green Infrastructure Summit on Feb 21 & 22 at the Embassy Suites in Tigard, OR. 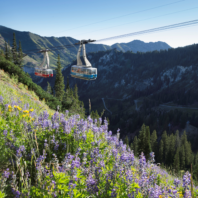 This summit will connect government and agency personnel, University researchers, and Extension professional, to create new collaborative networks, identify research and education priorities, and share existing resources. There’s a new club at WSU, the Water Resources Club. 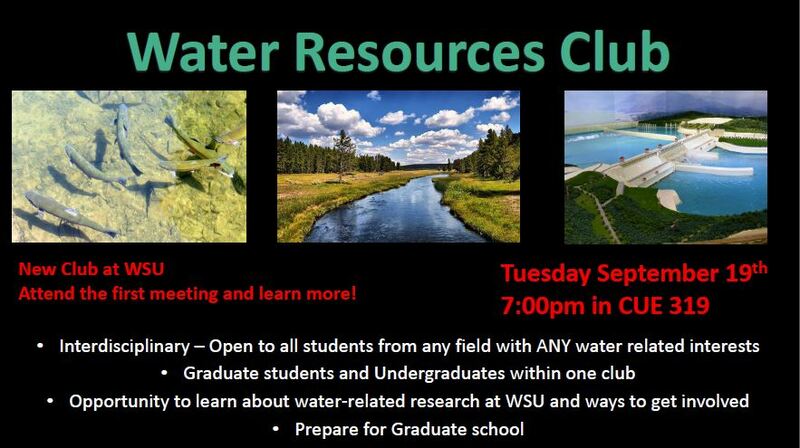 Where undergraduate and graduate students interested in water-related sciences can have a hands-on opportunity to experience each other’s research, share in new opportunities, and socialize in a relaxed environment. Attend the first meeting and learn more! Tuesday, May 16 to Wednesday, May 17 in Yakima, WA at the Yakima Convention Center. The Washington Stormwater Center is in need of volunteers to help with the Washington State Municipal Stormwater Conference, MuniCon 2017. Over 300 municipal stormwater managers and related stormwater professionals around the state are registered to attend. This is a great opportunity to expand your network in stormwater by making connections and to learn about industry tools and cutting-edge management techniques. Commit to work a four-hour shift, preferably starting at 7 am or 11 am either day of the conference. We will work with you on scheduling and will do our best to accommodate your schedule. Conference fee will be waived for you to attend day one workshops, day two presentations, and networking events. On conference days, we will need help with administrative tasks, information services, presentation assistance and other assigned tasks. Please send your name, the best way and time to reach you (e.g. text, e-mail), volunteer work time preference, and any dietary restrictions to Laurie Larson at laurie.larson-pugh@wsu.edu or 253-445-4593. Seeking graduate students with research, experience, or interest in the areas of water demand management, water supply, and water conservation. To facilitate student attendance, WSI is funding 20 graduate (M.S. or Ph.D.) student scholarships to participate in their conference. The scholarship will pay for the students a) full conference registration, b) registration for one pre-conference workshop or post-conference technical tour, c) three nights lodging at the conference hotel, d) up to $500 reimbursement for round trip airfare including luggage fees or up to $250 reimbursement for use of a personal vehicle for travel, and e) a $100 prepaid VISA card to assist with meals and miscellaneous costs. Students will be responsible for their own local transit, parking, and meals. Recipients will be reimbursed for travel by check at the conference. The maximum value of the scholarship is $1300. Please respond via email to Jon Yoder (yoder@wsu.edu) or Jacqueline McCabe (jacquem@wsu.edu) by May 4 if you would like to receive a graduate student scholarship. If you wish to be considered for an oral presentation slot, we will need their contact information and 300 word maximum abstract submitted by May 4, 2017. If you are planning to present a poster, we will need contact information (name and email) before or by May 17, 2017. Meeting scheduled May 1, 11:00am in PACCAR 305 in regards to this application. Agricultural air emissions produce significant local, regional and global impacts, such as odor, particulate matter (PM) exposure, eutrophication, acidification, climate effects, exposure to toxics, and pathogens. Excess reactive nitrogen threatens the quality of air, soil, and water, with implications for human health and the environment. Most important in the US are ammonia (where agriculture accounts for ~90% of total emissions), reduced sulfur (unquantified), PM2.5 (~16%), PM10 (~18%), methane (29%), nitrous oxide (72%); and odor and emissions of pathogens (both unquantified). Reactive nitrogen inputs in the US and the world have been increasing, largely due to human activities associated with food production and fossil fuel combustion. Despite the obvious benefits of a plentiful supply of food and energy, the adverse consequences associated with the accumulation of reactive nitrogen in the environment are large. Nitrogen pollution poses an even greater challenge than carbon, because once a new reactive nitrogen molecule is created, it can, in sequence, travel throughout the environment contributing to major environmental problems, i.e., the nitrogen cascade. There is a need for an integrated nitrogen management strategy and new policies that cover these concerns, while simultaneously challenging the scientific community to continue quantifying the benefits of nitrogen mitigation.